With clients such as Cher, Elton John and Ozzy to name a few, Martyn Lawrence- Bullard is a genius at creating masterpiece homes for world-famous musicians. Hidden completely from the street, this elegant three-level Malibu villa of Kid Rock is surrounded by palm trees and a lush plant filled courtyard. Kid Rock wanted to create a complete oasis, and Martin has taken inspiration from the tropics to create this warm, inviting space. The main rooms are located in the ground floor which has stunning views of the green landscape. Here in the master bedroom is a grand four-poster bed with sumptuously draped white fabric hung high from the custom wood-paneled ceiling. This leads into a large living room adorned by stunning furniture chosen by Martyn Lawrence-Bullard. This room combines Sitar’s with electric guitars, with the focal point being a grand piano gifted to Kid Rock by Elton John. Moving into the kitchen and dining room, the stainless steel appliances elegantly contrast with the natural wood found on the ceiling, floors and cupboards. Upstairs is a recording studio where Rock could have late night jam sessions, while downstairs Lawrence-Bullard has added a screening room, gym, game room and four guest rooms for visitors. This is a perfect example of transforming a rock stars passions and desires into a dream retreat. The front door entrance view which is surrounded by lush green plants and is almost hidden deep with the depths of the area. Kathryn Ireland and the vintage Antlers are from Alfie’s, London.Master bed is “Harbour Island” custom-made by Martyn Lawrence-Bullard draped in white muslin. 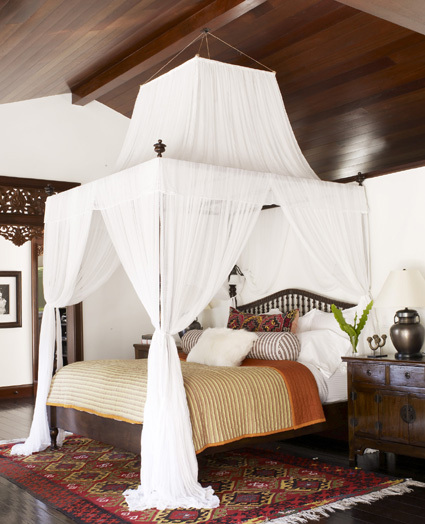 The rug is Vintage Tribal Kilim from Uzbekistan while the bed cover and pillows are Antique French textiles. Lamps are Hollywood at Home and Cowhide goat fur pillow is from Harrods, London. The master bathroom has French limestone and queen marble detail with inserted Indonesian detail. 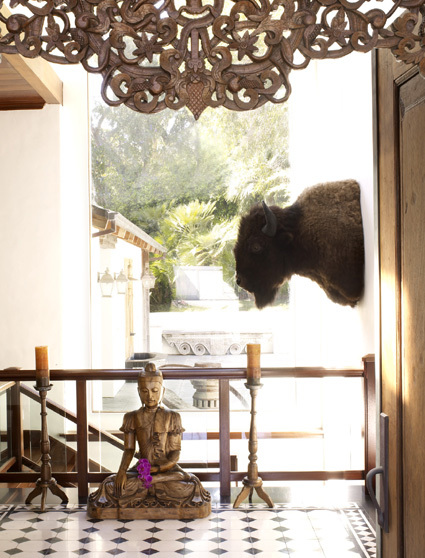 The bamboo shades are from Interior Specialty and the Faux Ivory tusks from Williams Sonoma Home.The Master closet are Antique carved Indian doors while the 19th century Syrian folding chair is from Horseman Antiques, London. 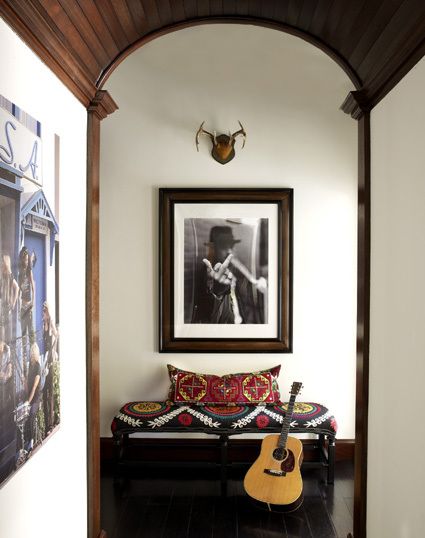 Living room Art is by William Claxton and Frames are custom-made by Martyn Lawrence-Bullard home. The bench is from Brenda Antin, LA while the sofas are from Shabby Chic, LA. 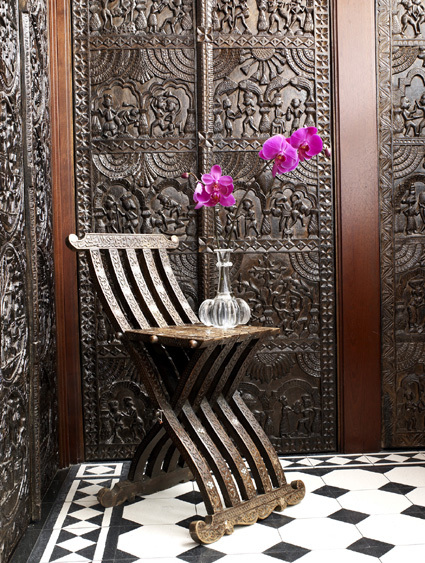 Pair of antique club chairs by Jean de Merry and 19th century Indian “Sitars” from Charles Jacobson. Coffee table is custom red-painted “Indochine” by Martyn Lawrence-Bullard Home. Sea Grass rug from Designer flooring and side table in an antique Indian table from Sotheby’s Auction, New York City. 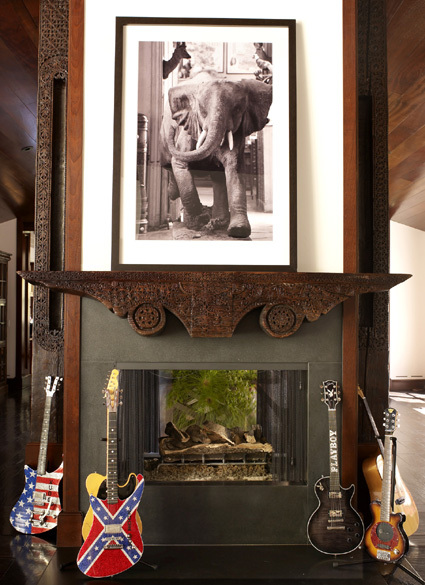 The Black Soap Stone Fireplace has Antique Indonesian architectural fragments from Opium imports, London.The Artwork above the fireplace is Elephant in Derol Museum. And it also showcases Kid Rock’s Guitar collection. Dining Room Artwork is “Lais in Havana” by Michael Eastman. Wine table is French Antique from Dos Gallos, LA. Benches are custom-made by Martyn Lawrence-Bullard Home. Fireplace is Antique Indonesian architectural fragment. While the wash basin is Vintage red Chinese used for fruit from Mecox Gardens, LA.Kitchen cabinets are Poliform, Stools are French antiques “jeweler’s” stools, light fixtures are Urban Archeology and Storage jars are from Zodiac. Posted on July 10, 2012 September 3, 2012 by AparnaPosted in Decor, Design, Interior Design, Photo Essay, UncategorizedTagged celebrity, decor, design, Elton John, Home, House and Garden, Interiors, KidRock, Lawrence-Bullard, malibu, Shabby Chic, Villa, William Claxton.